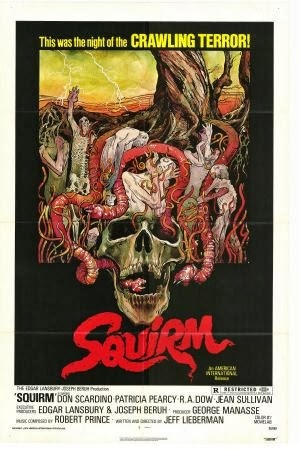 Rupert Pupkin Speaks: Arrow Video: SQUIRM on Blu-ray ""
"Tell him about the worms." Jeff Lieberman is a filmmaker I have a lot of respect and admiration for. He's only made a handful of features, but he has a very specific authorial stamp in terms of the genre films he's put out. His genre work also has some nice variety to it. From the electrically-charged killer worms on the loose in SQUIRM, the backwoods slasher antics of JUST BEFORE DAWN to the acid freakouts of BLUE SUNSHINE and the alien mind controll-y-ness of REMOTE CONTROL, he's crafted a neat little group of cult favorites. I've even yet to see his 2004 feature SATAN'S LITTLE HELPER, but I've only heard good things. One thing Lieberman always seems to mix into his movies is a fun, offbeat sense of humor without losing the thrills, scares and creeps of each particular story he undertakes. He's a low-budget director, so that makes me think of him as independent guy who makes movies his own terms for the most part and that's one of the things I admire about him. I know that the programmers at Cinefamily were looking for some cool examples of regional horror and Lieberman's movies are great portraits of the areas they were filmed in. SQUIRM was filmed in Port Wentworth, Georgia in 24 days. It absolutely has that regional flavor that is often quite an enjoyable outcropping of this sort of shoestring budget cinema. Though Lieberman uses actors that aren't resoundingly experienced(and clearly some non-actors too), he directs and photographs them at a level that elevates this material above others of a similar ilk. I'm personally a huge fan of the "animals attack"/"nature strikes back" genre so this one already has a leg up in my book. It also features some early special effects work from the great Rick Baker and that can only make your movie better. He does a nice job making these worms make your skin crawl(and crawl inside your skin!). Those effects, and the assured directorial control of a cult auteur like Lieberman make it easy to see why this movie has hung on so long in the esteem of horror movie fans all over. Its well put-together, suspenseful, disgusting and funny throughout. Quality stuff. This Arrow Video Blu-ray maintains the level of quality they've been shelling out this year in that it looks and sounds really great. One of the things I neglected to mention above is the music in this flick. It's kinda cheesy and synthy, but it just adds to the overall feeling of this very non-Hollywood production. It all sounds great here too. -High Definition Blu-ray (1080p) and Standard Definition DVD uncut presentation. -Audio commentary with director Jeff Lieberman. -Filmed Live Q&A session with Lieberman and star Don Scardino from New York’s Anthology Film Archives (2011). -The Esoteric Auteur - Kim Newman on Jeff Lieberman and Squirm. -Reversible sleeve featuring original and newly commissioned artwork by Gary Pullin. -Collector’s booklet featuring new writing on the film by Lee Gambin, author of Massacred by Mother Nature and an interview with Jeff Lieberman by Calum Waddell, illustrated with original archive stills and posters.